Growing Season shows a large flowering rose climbing out of a central framed work of art and into a ﬁeld of green. Growing Season shows a large flowering rose climbing out of a central framed work of art and into a ﬁeld of green. Dial has used similar compositions in several recent works, including Coming Black Clear (2011) and History Lesson Survivors (2007). All of these paintings express the development of various aspects of African American life and culture, using plants and flowers as symbols of growth and achievement in the face of adversity. Growing Season, in particular, celebrates Dial’s personal success as an artist and the continued appreciation of his work. Plants germinate inside the frame, growing and flowering both within and outside of the work, surrounded by the material success and development embodied by the color green. 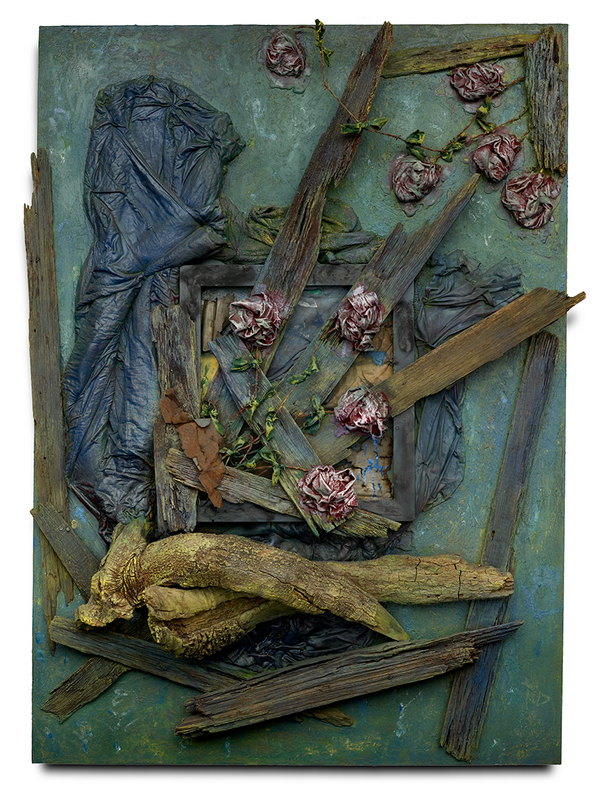 This painting was created in 2011 during a period of great success for Dial, including the exhibition Hard Truths: The Art of Thornton Dial, and complimentary articles in Time, The Wall Street Journal, and The New York Times.